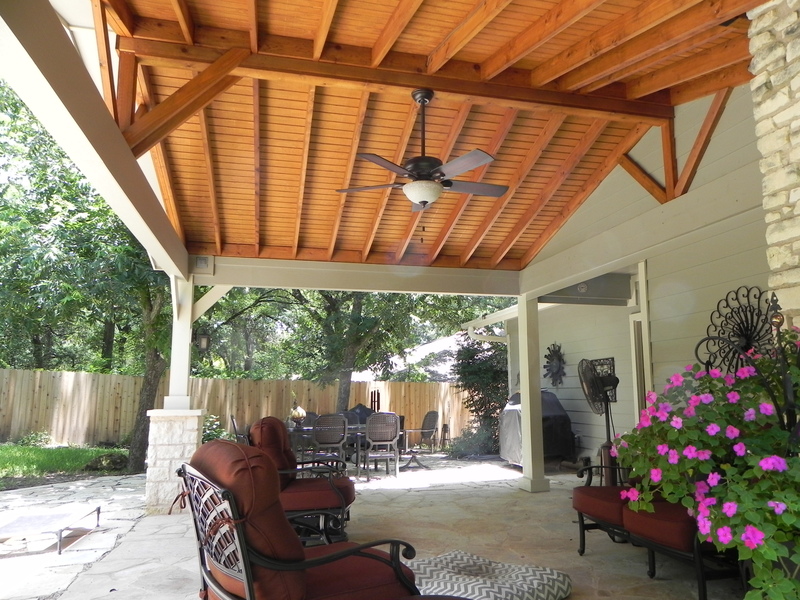 Our outdoor living space addition in South Austin is a good example of the way Archadeck of Austin is changing the way homeowners are able to utilize, and enjoy their backyards. We are able to deliver these kind of results in two ways; #1 we can transform the vision of your ideal backyard and bring it to life from the ground up, an #2 we can convert an existing outdoor living structure into the backyard of your dreams. The possibilities are truly endless! 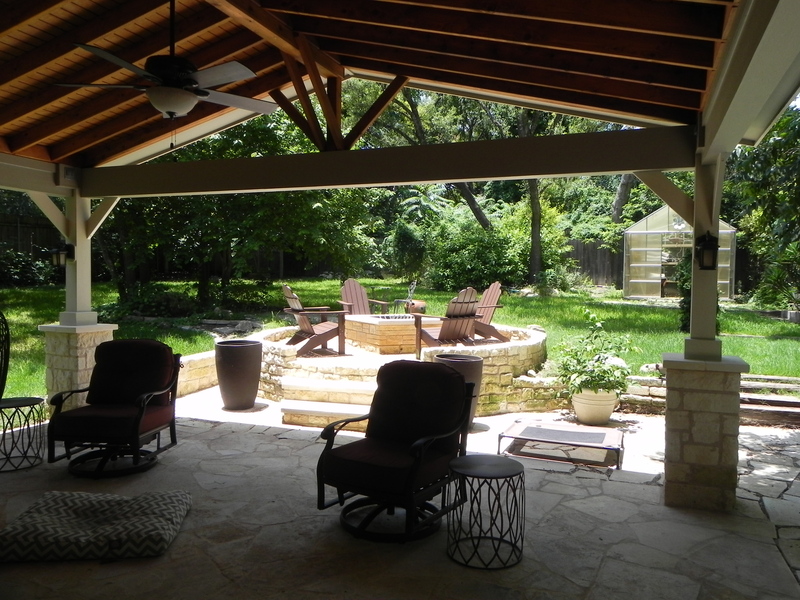 In the case of these South Austin homeowners, they had an existing outdoor space consisting of an aging backyard pond and an exposed aggregate concrete patio. The pond had become a chore to maintain as it had become a nursery for mosquitoes making spending time in the backyard a challenge to avoid being bitten, especially after dusk. Archadeck of Austin consulted with the homeowners and listened to their vision of what they wanted their backyard to be. They wanted a spot that was versatile in that they could find a respite from the hot Texas afternoons and relax in mosquito-free comfort. They still wanted to be able to take in the ambiance an open fire provided too, so the new design had to incorporate a fire pit. With these ideas in mind, we set out to bring their anticipated outdoor space to life. There were some obstacles to overcome in order to give these South Austin homeowners the environment they wanted. One of which was having to finalize a design that would pass the impervious cover requirements needed for their localities. Once this was confirmed it was smooth sailing! 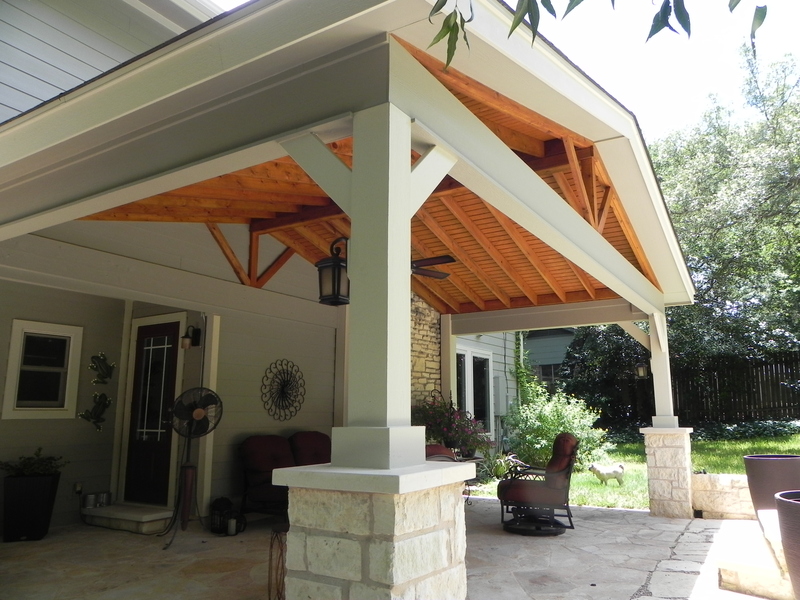 The project also needed to be mindful of some drainage issues and maintain some space outside the covered porch to accommodate their outdoor grill. 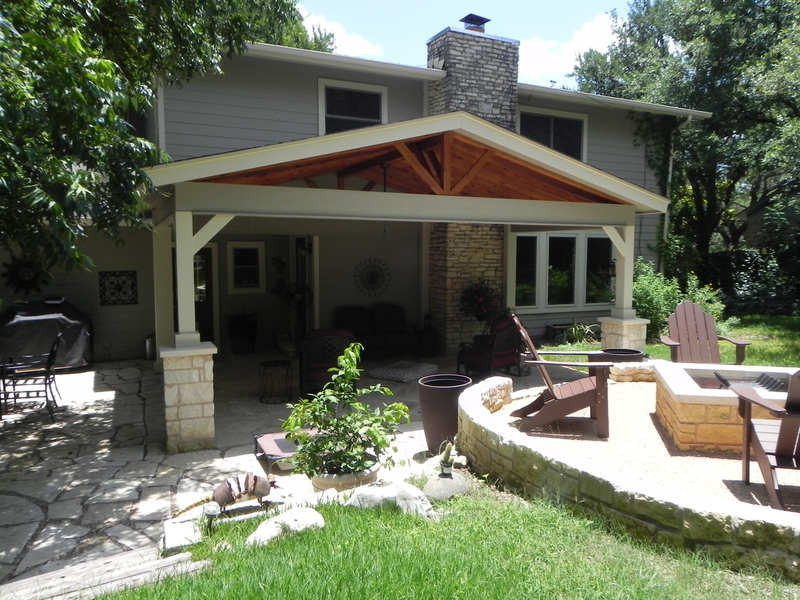 The completed project is multi-faceted and included transforming the concrete patio by way of installing flagstone atop the existing patio and covering a portion to give the homeowners the needed shade they desired. 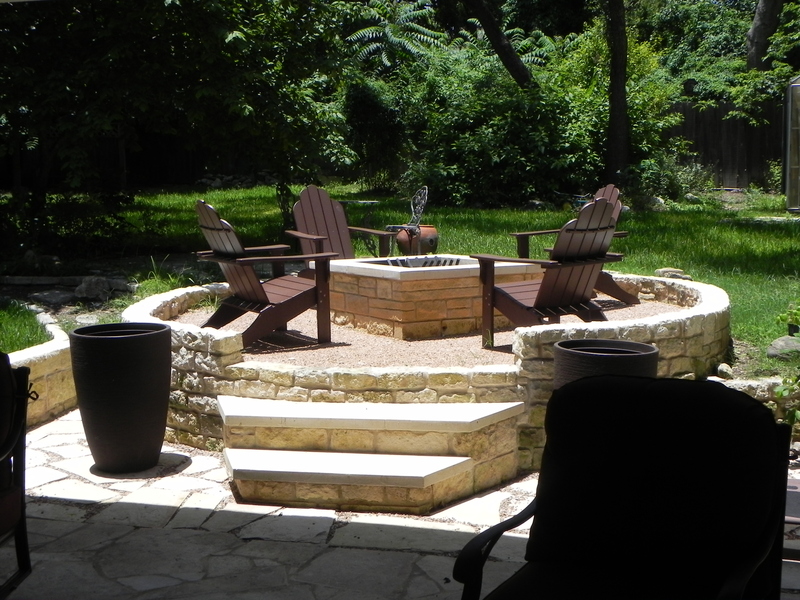 In addition to the extensive upgrades just off the rear of their ranch style home, we also created a detached space that includes a custom stone fire pit encircled with a hardscape retaining wall, which can also double as seating. The fire pit is just a stone’s throw away (no pun intended) from the covered patio which allows the spaces to be enjoyed simultaneously. To the side of the porch and connecting all the way to the driveway we constructed a patio/walkway using an Oklahoma variety flagstone on a bed of decomposed granite and pea gravel. This allowed for a good solid surface but allowed any water to absorb into the soil. The clients are elated with their new backyard — which is far more than just an outdoor living space, it is a completely new outdoor living environment! 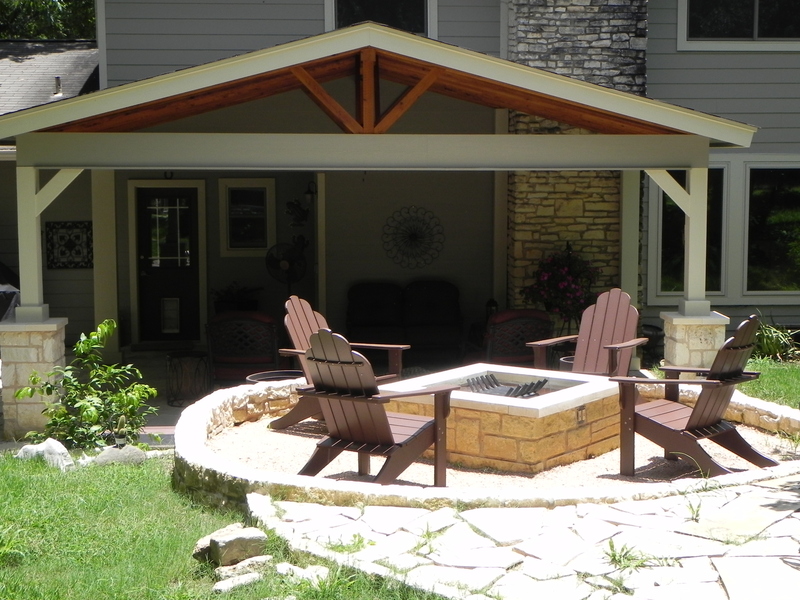 If you are ready to change the way you and your family live outdoors, contact Archadeck of Austin today to begin the process today — you can reach us by phone at at ( 512) 259 – 8282 or email us at jim.odom@archadeck.net. This entry was posted on March 8, 2016 by austinporchandpatio. It was filed under Archadeck of Austin, Austin patio cover, Covered patio Austin, Flagstone, Flagstone Patios, Natural stone outdoor structures, Outdoor fire place, Outdoor rooms, Patios and was tagged with Archadeck of Austin, Archadeck of Austin design, Austin covered patio, Austin custom covered patios, Austin flagstone patio, Austin flagstone patios, Austin patio builder, outdoor fire pit, South Austin Covered Patios, South Austin Outdoor Rooms, South Austin Patio Builder, South Austin TX Flagstone Patios, Unique patio designs Austin TX.